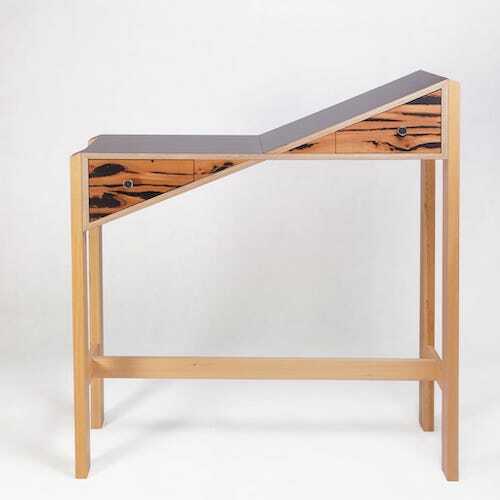 I’m Stephen Ziguras and I’ve been designing and making fine furniture for nearly two decades. I specialise in making bespoke furniture from sustainably sourced new and recycled timber. I started Eco wood design while my partner and I were living in Copenhagen, Denmark in 2010. My designs are influenced by the Arts and Craft Movement, as well as Danish design and Japanese techniques, and I look to recycled and sustainably sourced timber in order to help the environment in any way that I can. A technically complex piece: the overall form is based on the client imagining as a child that the thunder she heard during storms could be powerful enough to distort the furniture! Inspired by species of branching coral, Coralie the coat rack is a functional piece which makes a sculptural statement. The S(l)ide table started as a pun – a table that you couldn’t put anything on, but practicality intruded resulting in a useable piece which reflects its whimsical origins.